Find a wide range of temporary containers to fit your project. 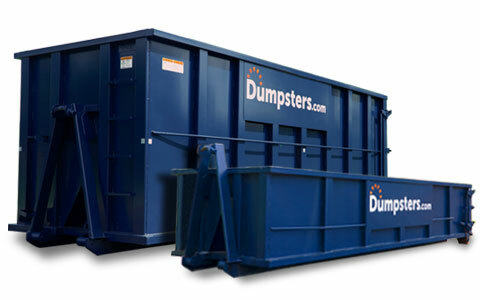 These big dumpsters provide a convenient option for disposing of material from one-time projects or construction jobs. No matter what you’re working on or the amount of debris you need hauled away, Dumpsters.com will find and deliver the right roll off bin size. Check out our containers below or give us a call to talk over your needs with our team. Get a quick look at your options with our roll off dumpster size chart below, or skip down to find a container size that fits your specific project. Please note: Weight limits may vary by location. Choosing the right container size is important to make sure you don’t overload your dumpster or exceed the weight limit—both of which can result in additional fees. In most cities, dumpsters weighing more than 10 tons can’t be legally hauled on the road, so you may need to schedule empty-and-return service or rent multiple containers depending on how big your job is. If you’re on the fence about which roll off box best suits your project, consider going up a size. Select the type of job you’re working on to see what container sizes our team typically recommends for handling the debris. But keep in mind: depending on exactly what you’re throwing out, your particular project may require a different size than what’s suggested. When in doubt, call our team. This small roll off dumpster size is just right for attic, basement and other minor home cleanouts. From unwanted knick-knacks to outdated clothing, a 10 yard container can help you create a less cluttered home quickly and with less effort—no need to painstakingly bag things up. These small roll off bins have the same weight limit as a 10 yard container, but extra room to hold bulky items like furniture or appliances. This makes them ideal for decluttering areas like your garage or for cleaning out several rooms at a time. Use this size for major home cleanouts or decluttering projects that feature a lot of heavy or bulky items. They’re often the best choice for downsizing your belongings before a move, handling an estate cleanout or getting rid of multiple rooms’ worth of furniture or appliances. This debris box size is great for one-room jobs like tearing up the carpet in your living room, removing that old linoleum in your kitchen or replacing the tile in your bathroom. This small dumpster can fit in most driveways so it’s easy to clean up as you work. Use this size roll off container for home improvement projects that are on the smaller side but leave you with lots of bulky debris. For example, these boxes are ideal for things like replacing your kitchen cabinets and countertops or redoing your bathroom fixtures. This large dumpster size is a good choice for renovation projects that come with lots of debris. Use this container to handle the cleanup for multi-room remodels or even single-room updates that involve lots of different tasks— like renovating your kitchen from floor to ceiling. These big dumpsters hold the most debris of any container we stock. They’re best for significant home renovations like finishing a basement or attic, building an addition or making major updates to the entire interior of your home. Choose these small roll off bins for roof tear-offs with 10-20 squares of architectural or three-tab shingles. Our dumpsters can also haul underlayment, flashing and other common roofing materials. Use a 15 yard container to handle roofing projects with 20-40 squares of architectural or three-tab shingles. These small roll off dumpsters fit in most residential driveways and we make it easy to schedule empty-and-returns if you’re working with significant square footage or multiple shingle layers. This size is your best bet for roof tear-offs with over 40 squares of shingles. Since shingles are so heavy, you’ll usually need to rent multiple containers for jobs this large. Our team rents dumpsters to roofers all over the country – they’ll make sure you get the right number of containers to keep your job running smoothly. This debris box size can hold shrubs, tree trimmings, leaves and other yard waste from any typical job. Choose this container for things like cleaning up a small lawn, clearing away debris after a storm or removing old mulch from several beds. These small roll off bins have the same weight limit as a 10 yard, but come with more room so you can fit bulkier debris. Use these boxes for landscaping jobs like tearing out a large number of shrubs or small trees, clearing brush from a large area or redoing several flower beds. Need to get rid of dirt as part of your landscaping project? You’ll need a dirt dumpster, since soil usually can’t be mixed with other types of debris. This big dumpster can haul all common C&D debris, from lumber to drywall. Choose this temporary size for major projects like mid-size demolitions and small-scale builds like an outbuilding or in-law suite. Need a swap-out as you work? Our team will schedule them quickly over the phone. This is our largest dumpster size. They’re best for major demolitions, new construction, building a home addition or any other project with a high volume of debris. When you’re planning a big job, we make it easy to rent multiple containers at a time or coordinate swap-outs. Need to get rid of concrete, asphalt or brick as part of your project? You’ll need a heavy debris dumpster, since these materials usually can’t be mixed with other types of debris. Ready to Start Your Cleanup? Once you have an idea what roll off box size you need for your project, give our team a call for a free, all-inclusive quote. When you’re ready to order, we’ll get you set up for fast delivery in just a few minutes. And if you’re still not sure what size you need, our team will talk over your project with you to make sure you get the right container.